E-Filing or electronic filing is referred to as electronically submitting legal documents to a court that accepts this method of filing. Depending on the court system, attorneys can file their documents via electronic means which is more convenient and faster. Some courts have a mandatory e-filing system. Evading service of process means tending or seeking to evade; elusive; avoid accepting service. The reason for evasiveness may be to avoid something unpleasant. When an individual evades service, depending on the jurisdiction an evasion affidavit may be filed with the court. When a defendant has acted to evade service, an Evasion Affidavit is filed with the court. For example, according to Maryland law, when proof is made by an Affidavit of Due Diligence and Evasion that a defendant has acted to evade service, the court may order that service be made by mailing a copy of the summons, complaint, and all other papers filed with it to the defendant at the defendant's last known residence, by delivering a copy of each to a person of suitable age and discretion at the place of business of the defendant, or by posting same to the defendant's last known residence or usual place of abode. Eviction is when a landlord legally removes a tenant from his/her rental property thus terminating the tenant/renters occupancy. The act of turning a tenant out of possession, either by re-entry or legal proceedings, such as an action of ejectment from rental property. An express process is one of four levels of service that Writ Legal offers in regards to service of process. An express process will be attempted within three to four days. 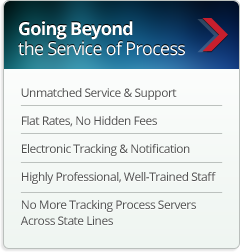 Other levels of service include Standard Process, Priority Process, and Urgent Process.